CFN – Local food is easy to recognize when visit the farmers’ market. The farmer is standing right there offering her own produce, assuming you are not dealing with the trader who merely stocks up at the Food Terminal. But what about processed foods in the supermarket? The local products are not so easy to recognize as many players isolate the consumer from the farmer. Here is a success story of a local food product – tofu bearing the brand of La Soyarie in Gatineau QC, produced from soybeans grown and prepared in eastern Ontario and Western Québec. While the package does not make a local food statement, this story tells the tale from local field to your fork. 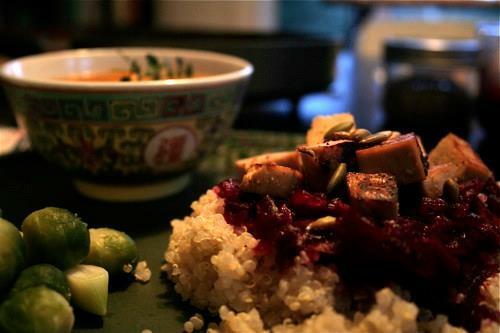 The story of a brick of tofu starts on a farm somewhere in eastern Ontario. Two of the farmers who grow soybeans are Jason O’Brien in the Ottawa Valley and Rod Ewing in Glengarry County. To grow a good tofu-making soybean requires choosing the right variety, seeding at the right time, maintaining low weed populations, and completing a good harvest without too much dirt and other foreign materials. 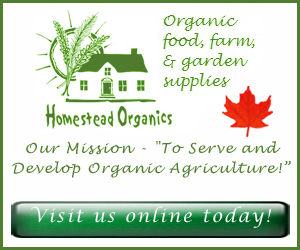 After harvest, the beans are stored on the farm until they are delivered to Homestead Organics in Berwick, North Stormont ON. Homestead Organics in Stormont County acts as a grain elevator, adding value to the soybeans by assembling and coaching growers, supplying seed to growers, storing the oilseeds in proper conditions for year-long supply, verifying for the required quality, and cleaning out the foreign material and the split beans. On a monthly basis, the team at Homestead Organics bags up the soybeans and delivers them the tofu manufacturer. La Soyarie is a tofu maker located in Gatineau QC. Operated by Koichi Watanabe, La Soyarie has been in operation for over 25 years. We can say from personal experience that their tofu is very good quality. The process of turning soybeans into tofu is fairly simple: you make soymilk and then you curdle it. Of course, when you make as much tofu as La Soyarie does, you need some specialized equipment. A vat of soybeans soaking. How do you milk a soybean? It’s a question that has plagued dairy farmers for centuries… In fact, the beans are soaked overnight, cooked in a high-pressure cooker, crushed to a pulp, and then strained to extract the milk. Once the soymilk is extracted it is mixed with a curdling agent that causes it to thicken. The thickening soymilk is pressed to squeeze out as much water as possible. This leaves us with a large flat tofu cake that can be cut into bricks, sent through a cooling water bath, and bagged in its finished package. Boxes of La Soyarie tofu are distributed to grocery stores all around eastern Ontario and Quebec. The fresh tofu cools in a water bath. Packaged up and ready to be shipped. We buy our Soyarie tofu at the local grocery store. It’s a great little shop with lots of local foods from the farms and market gardens in the area. Once the tofu gets into our kitchen, we know exactly what to do with it: we make Maple Tofu – the perfect way to make a simple single dish meal into something of a treat. Cube half of the tofu brick into about ½” pieces and fry in a generous amount of maple syrup, soy sauce, and lemon/lime juice. Cook until the liquids have evaporated and the tofu is coated in a nicely browned layer. You may want to add some water if necessary. Serve the tofu on top of quinoa and steamed garlic with greens, beets or whatever you have on hand, like kale, chard, spinach, or Brussels sprouts. Finish it off however you feel inspired: sprinkle some pumpkin seeds, drizzle some flax or sunflower oil, squeeze some lemon. As I sit down at the table, I think about the fact that not too far away and not too long ago a farmer was walking through a field of soybeans, perhaps the very field that contributed to this meal. I feel a sense of gratitude for the hard work and great care taken by all the people involved. Without the commitment and dedication of all these organic farmers, organic food processors, and organic retailers, it would be a very different world we live in!